Our walk along the Yucatán beach on the Gulf of Mexico is turning into a voyage of discovery, despite the fact that we are a half-hour drive from the closest Mayan ruins. nearby homes and restaurants in the port city of Progreso. Beach house on the Gulf coast of Yucatan near Progreso. the village of Chicxulub, six kilometres up the coast from Progreso. in low-rise condo buildings in Progreso come complete with maids’ quarters. Easter celebrations become non-stop parties. Mérida, making the last leg to Progreso by taxi. with the noisy nightlife of Cancún and the rest of the Mayan Riviera. met people from Alberta, Ontario, New Brunswick and Quebec. sprawling site a half hour away by car. Mexico, a testament to the construction prowess of the modern Maya. 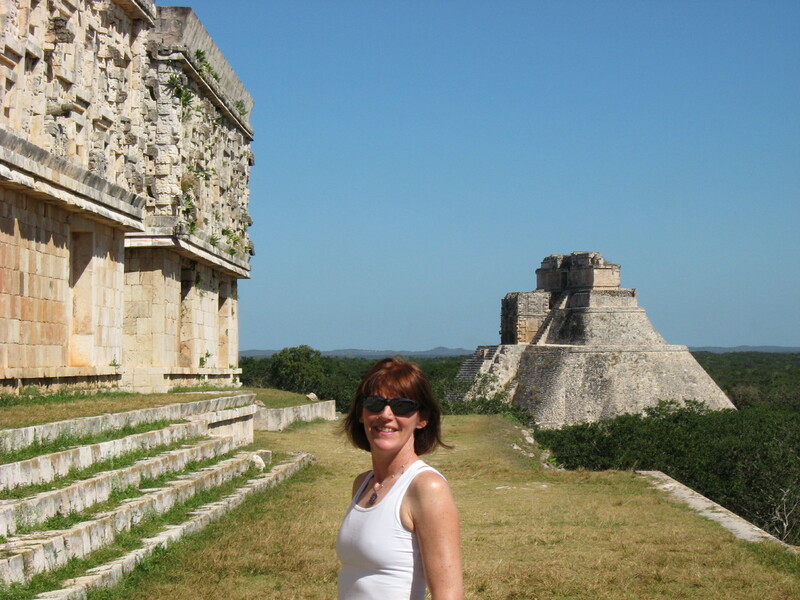 Pyramid of the Soothsayer at Uxmal rises 35 metres (behind my wife Stephanie) and is 11 metres higher than Chichen Itza. then the buildings on the site where an estimated 40,000 people once lived. 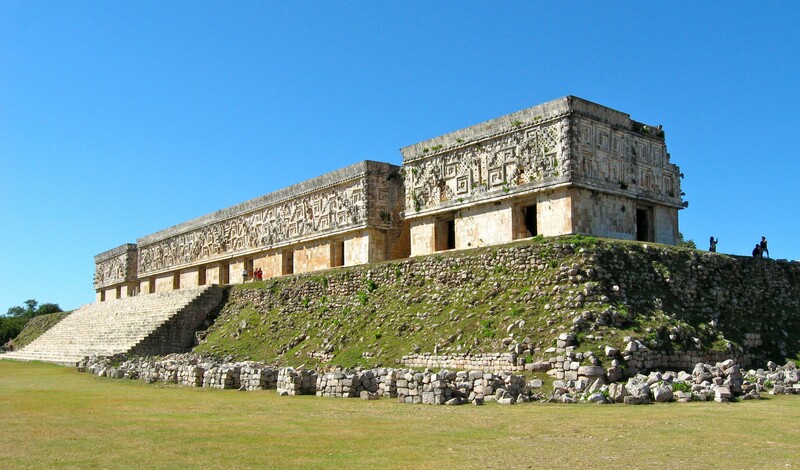 for Uxmal, 90 minutes away in the Puuc hills south of Mérida. flowers representing the third eye. I had only associated with big-box hardware stores up to this point. their boundless imagination in creating myths and stories. of the frequent references that local people make to their heritage. stalagmites and stalactites and lit by motion-sensitive lights. most recently used by Mayan slaves escaping Spanish landowners. fitting restorative after a long day. attract thousands of noisy birds coming to roost for the night. of the climate and the possible extinction of the dinosaurs. one-way trip costs from $25 to $30. We saw military posts along the highway with well armed soldiers, a not unusual sight in Mexico. We have not seen violence of any kind on several trips to this part of Mexico. provider before leaving that you can access the local network. real estate). It has a ton of information on Yucatán life. ecological site at Yucatan Today. In the two times that i’ve visit Uxmal, i didin’t had the chance to see the ‘Governor’s Palace’ so green, it looks so beautifull!! There are people working hard to help with the issue of stray dogs and tourists could contribute. “No Mas Perritos” are the people in Progreso. There are rescue groups in Merida(Planned Pethood), Playa del Carmen(Coco’s), Cancun and I have started a project http://www.gofundme.com/balamdogs. Controlling the population of feral dogs and cats not only makes it more comfortable for tourists not having to see them but it saves indigenous species and prevents suffering for the strays. Please, if you wish,add my note to your article. Awareness of the problem is very important for the masses of tourists who enjoy 2nd and 3rd world countries. If every traveler made a donation, it would have incredible positive results.